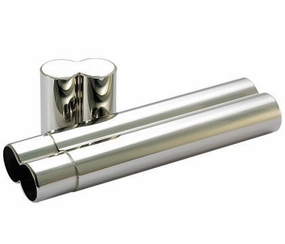 This high polished stainless steel double barrel cigar holder will keep your smokes personal and safe. This engraved cigar holder is built strong to keep 2 cigars fresh and ready to be enjoyed so even as one burns out you will have a backup when needed. Each barrel can be engraved with a name, initials or message on both the front and back. Our personalized cigar holders and engraved cigarette cases will keep your smokes in perfect condition while maintaining a look of sophistication and class.